Bassam Jalgha: Lebanon is still a fresh market for innovation and Entrepreneurship take a lot of time to pay off. Bassam Jalgha was born and raised in Beirut. Got his BE in Mechanical Engineering from the American University of Beirut and continued his Masters in the same field with a concentration in Mechatronics. His graduate research topic was in robotics, specifically in fall avoidance of embedded humanoid robots. Previously he worked as an instructor at AUB teaching Mechatronics and Control systems labs. Bassam also has a personal devotion to music. He studied Oud instrumental music at the Lebanese National Conservatoire and spent most of his life learning and developing his musical skills. In 2009, Bassam won first prize in “Stars of Science” season 1 a Pan-Arab innovation contest. His project, “Dozan” was an automated tuning device for string musical instruments. During the three-month competition, he was able to build the device and pass all the stages from engineering to product design to business and finally marketing. Since then Bassam has been devoted to developing the product, discovering the difficulties ahead, and overcoming them. You can find him @bassamjalgha. Tell us a little about how you got started in the innovation field in Lebanon and why did you decide to take this track (instead of looking for a job or a master's program abroad like most AUB engineers)? I was never satisfied with the job opportunities available for a fresh engineering graduate in Lebanon. When I finished my undergrad I was like the majority of other students: lost in the noise of what society expects me to be versus what I really wanted to be. There was this one course I took that changed all that, it was mechatronics. This was the first time in my life where I applied engineering knowledge to build (with my own hands) something intelligent that moves! I instantly knew that this what I want to do in my life, so I did my masters in robotics and at the same time I continued having fun learning how to build robots and other random electronics projects (that you can check on my unmaintained depotbassam.com blog). I believe it was a wise choice for me not to leave Lebanon then. Lebanon is still a fresh market for innovation; innovation is highly needed and valued by our society! As contradictory as it might sound, being in Lebanon at this very early stage opened up a lot of opportunities that otherwise would have not been available for me. What is Roadie Turner and why are you investing so much of your time and efforts to develop it? I have two contradictory personalities: the musician and the engineer. Roadie’s story goes back to when I was 12 years old. I learned to play the Oud which is an Arabic instrument that is very difficult to tune. So, being the geek I was, I decided to build a robot to tune it for me. In 2009, I participated and won Stars of Science the premier pan-arab competition for innovation for my project Dozan and 4 years later and about 5 different prototypes, Dozan became Roadie Tuner. 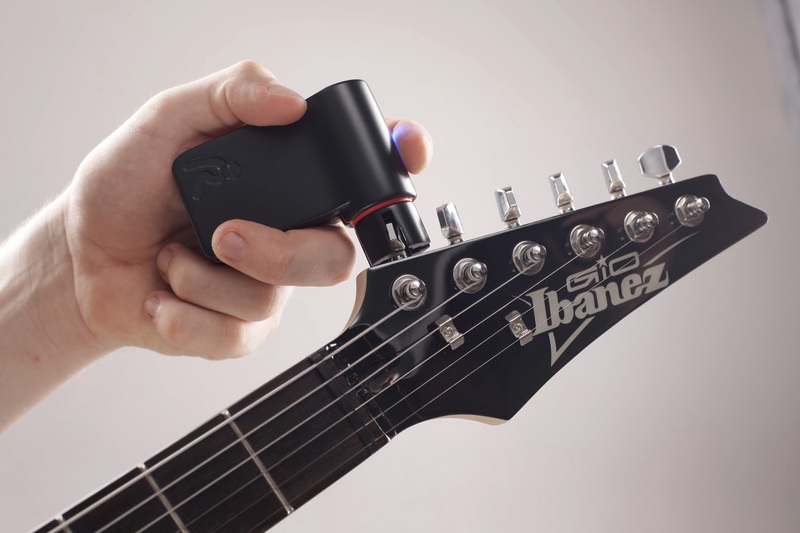 Roadie Tuner is an automatic tuning device for guitars; it connects to the tuning peg of the guitar and performs the tuning automatically, quickly and accurately. Roadie has an instrument doctor feature where it can also keep track of the elasticity of guitar strings and would inform users about their quality and when it is time to restring. Two years ago, you debuted a prototype of this product at TEDxBeirut. What has changed since then? Back in TEDxBeirut I had a prototype made of two parts: a base and a handheld tuner. Alot has changed since then, I partnered with Hassane Slaibi, a longtime friend and fellow musician, and we started the R&D for building not only a tuner but rather an assistant for the guitarists, and we moved from a prototype to a production ready product. We decided to harness the computing power in mobile devices so we dropped the base (no pun intended) and Roadie became a handheld device that connects via Bluetooth with a mobile device. A lot of the new features came after initial contact of Roadie with musicians. So now Roadie not only will tune the guitar, it lets musicians switch between different tunings seamlessly and will even help wind and unwind the strings. The instrument doctor feature is a proprietary technology that steams from the research done during that period. Why did you decide to go for a crowd-funding campaign to raise money to produce Roadie Turner? Tell us a little bit about your progress so far. It helps determine if there is a market for the product long before bringing it to market, hence reducing the risk on the company. If you can prove that there is market for the product it becomes much easier to approach potential investors, and easier even to reach distributors and retailers at an early stage. With crowdfunding you are fundraising to cover for production costs without losing equity in the company and without taking any bank loans. So far it’s been only 12 days into our campaign and we have raised more than $100K, about 167% of our initial goal of $60K. I've noticed that on Kickstarter, most of the perks are US based, where international backers have to pay extra for shipping. Does this mean that your start-up is based in the States? If so, why did you move it there rather than having it in Beirut? Our company is in fact an international collaboration. Development is in Lebanon, design is in Europe and manufacturing is in China. The reason international backers only have to pay for shipping is that Kickstarter doesn’t allow charging for shipment inside the US. This is something that has to do purely with Kickstarter policies. Do you believe that the Lebanese community does not support entrepreneurs and innovators well? On the contrary, the Lebanese community has witnessed a boom in the entrepreneurship scene in the past 5 years that cannot but give me hope for a better future. What is really missing is the proper infrastructure for startup development: the basic needs (electricity, internet etc. ), political stability, startup support from the government etc. This is especially true for a hardware startup; unfortunately Lebanon still lacks a lot of expertise and facilities for modern manufacturing techniques. This is mainly why we moved production to China. What was the reaction of the Lebanese Online Community to your start-up? The reaction of the Lebanese Online Community to the launch of our Kickstarter campaign has been awesome. If it wasn’t for all the shares and tweets that we got, we wouldn’t have been featured on Kickstarter as a popular item of the week and most probably we wouldn’t have reached our funding goal in the first 4 days. I personally was overwhelmed with the reaction and it kind of made me proud to belong to such a community. What is Lamba Labs and how are you involved in it? Lamba Labs is Beirut’s first hackerspace, it is a community of enthusiasts that likes to build things. With the purpose of spreading open access to information and knowledge, Lamba Labs is a physical space filled with tools and equipment where people would join in not only to build their projects and collaborate but also to give/attend workshops and teach. Hassane, my partner and I, are both founding members of the hackerspace. How was your experience with Stars of Science? Do you believe it gave you the necessary push or motivation to undertake this career track? My experience with Stars of Science was life changing. Winning the competition not only gave me the financial means to move along in this project, but it opened up an opportunity in my life that otherwise I wouldn’t have pursued. Stars of Science taught me that if you have an idea the only thing missing is just you going ahead and implementing it. What advice do you give to people who are interested in an innovation or entrepreneurial career track? If you can’t find a job, it is simple: just create one. However, from my little experience I can say that the innovation path is not an easy one. Not easy at all. If you decide to be an “entrepreneur” you have to know that it will be a very long way before you can afford to have a decent meal and be able to take your girlfriend/boyfriend on a decent date. But if it works the satisfaction is outstanding. I finally felt this satisfaction after people started putting their first pre-orders once we launched last week. Like I said before, Lebanon is still a fresh market for innovation. It is highly needed and valued by our society. So don’t be afraid and start building your ideas, and share your experience! Personally I made it my goal to get Roadie into market and to gain as much experience doing so only so that one day I can bring this experience back home and share it with my community.